We continue to maintain our close working relationships with the Norwood Residents Association and the Kensington Residents Association, as there are many common issues. We would like to distribute a copy this Newsletter to each letterbox in the area to inform residents of the activities of SPRA and to invite membership. If you can help by letterboxing your street please let us know by phone to Pauline 0400 366 215 or email newsletters@stpeters.asn.au. Membership Subscriptions to SPRA for 2019 are now due. Please consider renewing your membership. See the details on the Membership Page. St PETERS HEROES MEMORIAL. - GREAT WAR SERVICEMEN TO BE REMEMBERED. 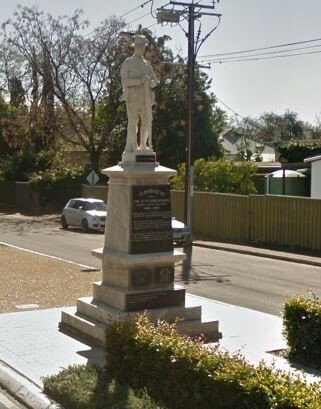 Last year the St Peters Residents Association (SPRA) received a grant from the Veterans SA - Anzac Day Commemoration Fund to research and fix bronze tablets containing the names of the fallen Great War servicemen from the then Town of St Peters onto the St Peters Heroes Memorial located on St Peters Street, St Peters. The Memorial, erected in 1922 by citizens of Council area, is one of the few Great War memorials that does not feature the names of the fallen. One hundred and forty-five men from the suburbs of Hackney, College Park, St Peters, Stepney, Evandale and Maylands have been identified, and will be memorialised on the tablets. The City of Norwood, Payneham & St Peters and SPRA will be holding a re-dedication service on Anzac Eve, Wednesday 24 th April 2019 at 10.30am, and the new bronze name tablets will be unveiled by the Governor of South Australia, Mr Hieu Van Le. For more information see http://stpeters.asn.au/heroes-memorial. All offers of assistance on the day would be appreciated. Contact David Cree on 0418 622 163, or by email to info@stpeters.asn.au. PLANNING CHANGES. - WHAT’S HAPPENING? The State Government is continuing to implement the new planning system at a lighting pace, which may see the undermining of our heritage protection system. These planning reforms are threatening our Historic Conservation Zones and their Contributory Items in a whole range of suburbs including St Peters, College Park, Hackney, Joslin, Royston Park, Stepney and Maylands. This is the same planning system that may allow a helipad immediately adjacent to the Residential and Historic Conservation Zones of Kensington, and Norwood. The most pressing issue is the fact that our Contributory Items may be at risk of losing their demolition controls, and as a result the Historic Conservation Zones are at risk. The new planning system is silent on the protection of these, even though they underpin our heritage protection system. The only people who have been lobbying for the removal of Contributory Items from the planning system are the lobby groups who represent developers and volume home building companies whose ‘modus operandi’ is building new homes, not renovating old ones. To demonstrate this, in its submission to the Parliamentary Committee Enquiry into Heritage in September 2018, the Urban Development Institute of Australia proposed that “the Planning and Design Code should remove all reference to Contributory Items (both existing and in the future)”. Similarly, the Property Council proposed that “all existing listing to be reviewed”. Many of us acknowledge that the current system of heritage protection is not perfect – but we must not let Contributory Items be easily demolished. If you want to protect our beautiful heritage, write to our local Members of Parliament requesting that the protection of Contributory Items and Historic Conservation Zones be maintained in the new planning system. local MPs and the Minister for Planning. In November 2018 Local Government elections were conducted. These elections occur every four years. In the St Peters Ward, John Frogley decided not to continue after 12 years of service as a Councillor. be sorely missed on Council. Evonne Moore, a long-time SPRA member and former President was re-elected. Newcomer Kester Moorhouse was comfortably elected to be the other Ward Councillor. All three were invited to submit an article for this Newsletter, and these appear below. After 12 years as Councillor for the St Peters Ward, I decided not to contest the recent Council elections. I appreciate deeply the support of St Peters, Joslin, College Park and Hackney Residents over those 12 years. Much was achieved over that period including the St Peters Town Hall redevelopment, an excellent residential area Development Plan and the repair of Council finances. Recurring and unresolved issues include “rat running”, speeding traffic and commuter parking in many streets. While timed parking has been introduced in some streets to address parking problems there is more to be done in our Ward. I was unable to convince a majority of Council that reduction of speed limits in residential streets to 40km/hr, as has been introduced in some other eastern Council areas would be a partial solution to the speeding issue and improve the safety and amenity of our residential streets. A serious threat to the ambiance and character of our treasured residential areas looms. This threat is just as serious as the cream brick walk up flats invasion of the 1970’s that was halted by concerted community action. State Government planning “reforms “promise a major erosion of heritage and character safeguards. The principal threats are the State Government takeover of all significant planning assessment decisions, the extension of tick a box Planning and Design Code provisions and the probable elimination of Heritage Conservation Zones and contributory item protections. Both major political parties at State level show an alarming lack of commitment to heritage protection and appear heavily influenced by a self-interested property development industry. Our community objectives for the future of our city as set out in the Council Development Plan will be thrown in the trash can. Demolition of treasured 100 plus year old heritage homes and replacement by inappropriate equivalents of the 1970’s walk-up flats will be facilitated. Despite strenuous efforts the Council has been largely powerless to halt this unnecessary vandalism. There is no shortage of medium and higher density development opportunities to meet the Government’s growth objectives without trashing our heritage areas. Only political pressure has any hope of halting this approaching disaster. I urge all residents to support SPRA and lobby their local Member of Parliament. I am newly elected as a councillor for St Peters Ward. I am 31 years of age, work for the Department of Human Services and have a degree in International Studies (Honours in Politics) from the University of Adelaide. I am keen cyclist and gardener. I sit on three council committees: the St Peter’s Childcare Centre Committee, the Cultural Heritage Committee and the Norwood Parade Precinct Committee. As I see it, the purpose of local government should be to improve people’s lives and to do so in an environmentally and economically sustainable manner. By supporting social infrastructure, such as libraries, athletic fields and public parks we can promote community involvement in things like book groups, sports clubs and community gardens. As such, council infrastructure helps foster a sense of community, something very much needed in this day and age. However, good social infrastructure needs good planning. Our state government is once again making changes to the planning and development rulebook with the intention of stripping back input from communities and handing over even more power to developers. Such a do-as-you-please approach to development means open space gets lost, heritage is undermined, and community facilities are left homeless. It doesn’t have to be this way and it’s thanks to groups like the St Peters Residents Association that we even have a shot at turning things around. Thank you for the privilege of continuing to represent the St. Peters Ward. Traffic, parking, development and trees are major issues in this area. worked to try to protect Historic Conservation Zones and Character Zones which now appear to be overlooked in planning reforms being pushed through under the new Planning Development and Infrastructure Act. At present the only regional plan for the inner suburbs is the 30 Year Plan for Greater Adelaide. This alarming document shows all the inner suburbs coded red for maximum infill development. The late Kingsley Turner was a long-time member of SPRA and a committed and passionate Volunteer, who worked tirelessly to restore and maintain the St Peters Billabong. He was a humorous, gently irreverent, generous, reliable and outgoing man. With a degree in science, Kingsley tutored at The University of Adelaide prior to his work with the State Government. He had extensive experience managing native vegetation landscapes with the Native Vegetation Branch of the Department of Environment. He worked on the native vegetation restoration of the St Peters Billabong as well as conducting his own research on water quality variations in the Billabong. Kingsley also lectured TAFE SA students in adventure tourism, outdoor and community recreation, and took many students and members of the public on guided tours of the Billabong and River Torrens precinct. The walk he developed explored the changing nature of the River Torrens at St Peters and the impact of European settlement in the 19th century. In 2009 Kingsley was recognised as the Citizen of the Year in the Council’s Australia Day Awards. Sadly, Kingsley passed away last year leaving the legacy of a better St Peters Billabong for the whole community to enjoy for many generations to follow. In recognition of his contribution to the local community, Council has installed a seat at one of his favourite places. The seat is marked by a plaque to commemorate Kingsley, the ‘Spirit of the Billabong’, and his significant achievements in the preservation of this special place.